The NAMM Foundation presented several opportunities for NAMM members and Nashville locals to create music at Summer NAMM. Attendees were invited to participate in the Guitar and Ukulele Circles, as part of the Make Music Experience, on Saturday, June 30. NAMM members and Nashville locals gathered in the afternoon to participate in the Ukulele Circle, presented in collaboration with Kala Brand Music. Attendees were given the opportunity to play Kala brand ukes, learning the basics from facilitator Ukulenny, and special guest and Kala artist Mandy Harvey. Ukulenny's hope for participants was an appreciation for learning something new, and inspiration to pick up a uke and play on their own. 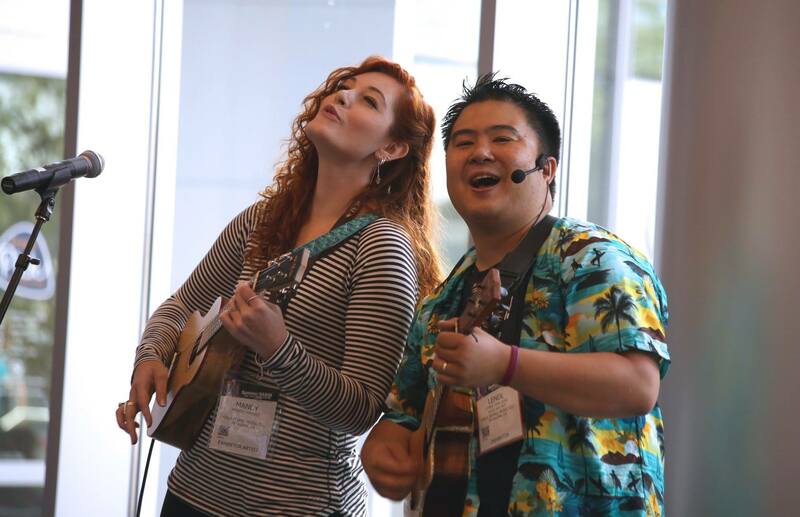 According to Vincent James, a Uke Circle participant and founder of Keep Music Alive, the experience of playing the ukulele with a group is always one of his favorite activities at NAMM shows. "It's amazing seeing folks who have never touched a ukulele before playing and singing songs from the Beatles, Journey, Katy Perry and more," he said. Earlier in the day, guitar enthusiasts joined together to participate in the Guitar Circle, presented in collaboration with the Guitar & Accessories Marketing Association (GAMA) and Fender Play. Attendees were given the opportunity to brush up on their guitar skills and walk away with new confidence. The circle was facilitated by GAMA’s Glen McCarthy. Guests were also invited to the Community Music Making (CMM) Forum in the NAMM Member Center to learn more about hosting or supporting a successful Make Music Day event in their city. They learned first-hand how retailers and manufacturers worked with Make Music Day city organizers to maximize their participation in this world-wide celebration of music making. Speakers included: Aaron Friedman, executive director of Make Music Alliance; Chalise Zolezzi, director of NAMM Public Relations; and Hayley Drewyor and Brandon Voorhees of Buddy Rodger's Music. The event was moderated by Claire Kreger-Boaz, senior project manager of The NAMM Foundation. Save the dates for 2019 Summer NAMM: July 18-20, 2019.